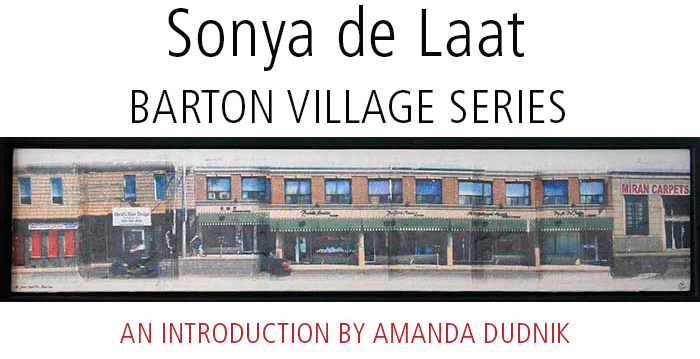 Artist Sonya de Laat employs a sense of wonder, discovery and revitalization in her Barton Village series (2009-2011). With a camera in hand and her children in tow, Sonya set out to photograph the North End of Hamilton. Her inspiration was drawn from the storefront shops in Barton Village along Ferguson Street to Sherman Street. Not only was Sonya interested in capturing the changes that come with development, but also the area's rich history. There are many businesses along the Barton Street stretch that have been around for decades, passed down from generation to generation. Entering shops and chatting with business owners, Sonya was captivated by the historical juxtaposed with the entrepreneurial. As Hamilton’s burgeoning art scene takes off, so does the entrepreneur looking to make their mark. Barton Street is still one of the more affordable areas in the city and it is just adjacent to the popular James Street North. Sonya focused on not only capturing the individual buildings along the street, but also the street as a whole. Through the process of darkroom development and heat image transfer, the hand of the artist is ever present in these seductive panoramas. The urban core, the sense of revival, the historical, is what comes across when looking at Sonya de Laat’s Barton Village series. Captivating the viewer through a sense of tactility and approachability, Sonya’s work brings new meaning to the North End. Just as the city is ever changing, there is never a shortage of inspiration for the artist. Sonya continues her journey through Barton Village, as there is always something new to find, document and capture.